Introducing the AutoCoop Solar Kit! 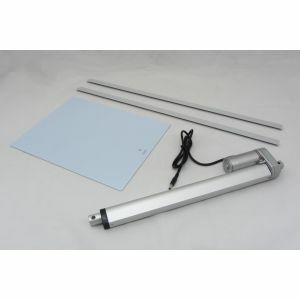 The AutoCoop Solar Kit uses the energy provided from the sun to generate the power needed to operate the AutoCoop Automatic Coop Door and LayLight. 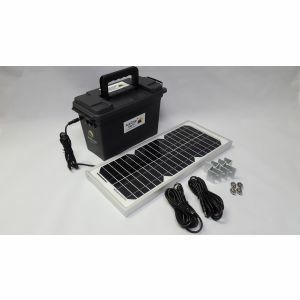 The kit comes with the hardware to mount the 10-watt solar panel on the outside of the coop with an extension cord long enough to place the battery control box inside the coop. You can then plug in the Automatic Coop door and the LayLight for off the grid operation. The AutoCoop door kit was designed to help keep your flock safe from predators. For chicken coops or any other need you may have for a small, sliding door. The chicken coop door is depicted as vertical, however, if desired, the door will work horizontally as well. 2.) Sliding door (high strength, weather-proof fiberglass with ultra-smooth finish), 13” x 10”. 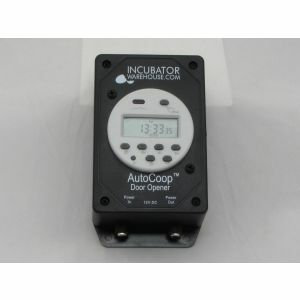 With this automatic timer you can set the time you'd like the coop door to open/close each day. Please note: If a controller is NOT selected for the AutoCoop Kit the buyer is responsible for determining how to activate the actuator. For example, whether to use a manual switch, timers, power relay, etc. The device used to operate the door must be able to switch the polarity to the actuator to open and close it. There are many ideas online showing how to do this. Does the timer have a backup battery inside it? Yes, there is a back up battery for the timer in case power goes out. Do you make a taller and wider door? The door that is included is 10" w x 12" h. However, you could use a larger door than this as long as the actuator is mounted correctly. What voltage does this take? 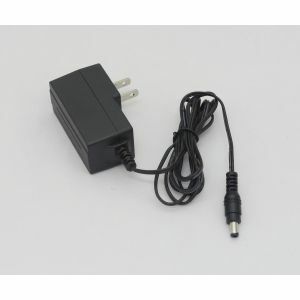 This unit comes with a 12 volt DC power supply that can be used in a 110v plug-in or hooked up to solar power. Can you program the actuator to open to a distance other than 100% open? Unfortunately we do not offer a way to adjust the stroke of the actuator arm, it is either fully open or fully closed. What happens if a chicken stands in the door and won't move?